From conceptual design through drafting and detailing, AutoCAD 2007 is all you need to create, visualize, document, and share your ideas. AutoCAD 2007 combines the familiar AutoCAD commands and user interface that you already know with an updated design environment, giving you the power to shape and explore your ideas like never before. An updated conceptual design environment makes the creation, editing, and navigation of solids and surfaces simple and intuitive. With all the tools in one place, turning your thoughts into designs comes easily. Improved navigation tools enable designers to directly interact with their models during creation and editing, making design alternative exploration more productive. 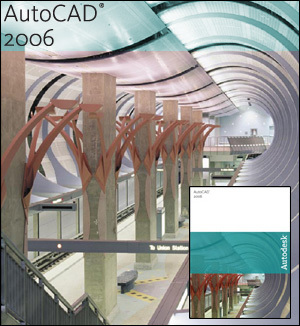 No matter where you are in the project lifecycle, AutoCAD 2007 enables you to convey your vision of the design with powerful visualization tools like walk-through animations, and realistic rendering. New animation tools mean you can expose any flaws early in the design process—before they can become problematic. At some point your design has to be built, and AutoCAD 2007 enables you to quickly and easily turn your design models into a set of construction documents that clearly and accurately depicts what is to be built. Sectioning and flattening tools enable you to work directly from the design model to create sections and elevations that can then be incorporated into your drawings. By eliminating the need to re-create model information for the design document package, you’ll save time and money, and avoid any errors that might occur during manual re-creation. AutoCAD 2007 expands the already powerful tools for sharing—like exporting current DWG files to older versions of DWG and exporting and importing DWF™ files with redline and markup information—as well as improves the ability to import and work with a DWF file as a drawing underlay. Plus, AutoCAD 2007 now has the ability to publish drawing files as in Adobe® PDF format. If you’re thinking of upgrading from a version of AutoCAD released prior to AutoCAD 2005, visit the Upgrade Center to learn how changes made to AutoCAD over the years can benefit your creative process and your productivity. authorization code for your installation.